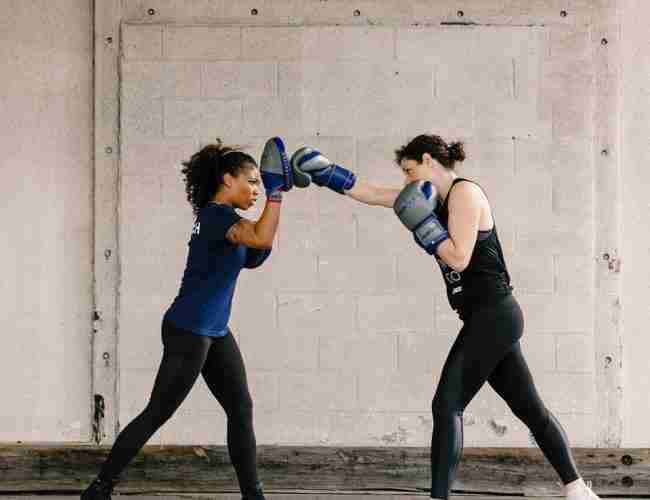 This H Street Northeast studio redefines the old-school boxing club with high-intensity, small-group workouts that mirror a professional boxer’s training program. At NUBOXX you will learn proper boxing technique, perfect your balance and hand eye coordination, and build lean muscle all while having fun. Our signature classes utilize heavy bags and gloves, while also packing in timed rounds of agility, plyometrics, core and strength training aimed to build toned bodies. Classes are 60 minutes and accommodate all fitness levels. At NUBOXX, each athlete will experience every element of a pro boxer’s training regimen. Not only will you condition your body and mind, you will gain strength, speed, and power through our unique, progressive training program and rotating schedule. Each timeslot will rotate weekly through one of our four signature class formats: Technical Boxing, Boxing Conditioning, Strength and Conditioning and 30/30. Each class is relevant to the next, like pieces of a puzzle. So no matter your schedule, you will still receive every benefit from this unique program. A NUBOXX signature class where your boxing technique is at the forefront. Be prepared to knock down your comfort zone in sweat- inducing timed rounds. Develop and sharpen your footwork and punches to evolve into an effective, elusive boxer. Work on your dance, shadow box, and speed rope. Feel liberated as you hit the heavy bag and target mitts. Build confidence and outperform your perceived limits all while having fun. This class is great for both beginners and experienced boxers. Designed to build your boxing endurance, this class turns your technical boxing skills up a notch into high intensity intervals with shorter rest periods. Pick up the pace on your dance and speed rope. Increase your turns and punches on your shadow box. Find your rhythm on the speed bag and conquer the heavy bag. Sweat and satisfaction guaranteed. Train your body to be faster, stronger, and more powerful in your boxing workouts. Intervals and circuits utilize the latest in strength and conditioning including Kettlebells, Battle Ropes, Plyometrics, Speed and Agilities, and more. Torch calories and melt body fat, improve your metabolism, and strengthen your mind as well as your body. This class does NOT use heavy bags, gloves or hand wraps. Get the best of both worlds with 30 minutes of boxing and 30 minutes of strength and conditioning. This class is a two for one in terms of building strength, speed, and power through traditional boxing movements as well as new age strength and conditioning concepts, tools, and equipment. Experience all that a boxer needs to get in shape and perform. Leave feeling well-equipped to knock down all that life throws at you! It is recommended that you take Technical Boxing or Boxing Conditioning classes before trying 30/30. We are just off of bustling H Street NE on the ground floor of the luxury Station House Residences. Our entrance in on 2nd Street (2nd Street and G Street, NE). We are steps from Union Station Metro stop, bikeshare stations, and streetcar. Nearby garage and street parking are also available. Sign up here for classes!